Keep your building safe with this watch your step sign. Warn staff and visitors to watch their footing by posting this 12 inch square notice sign that reads "WATCH YOUR STEP" in all caps. 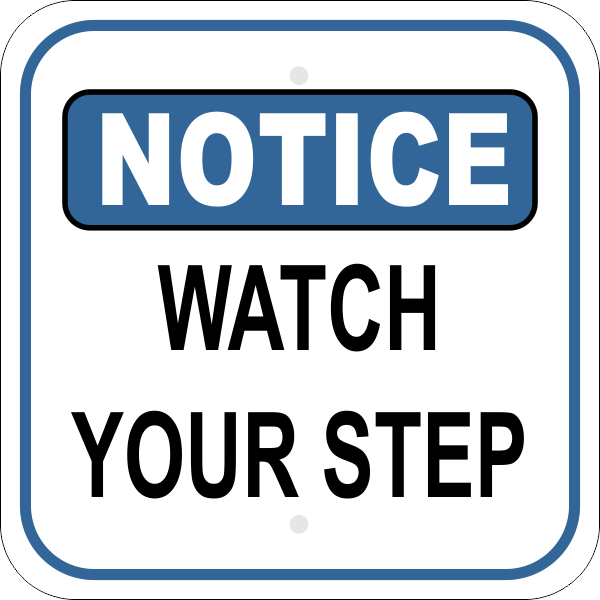 Help keep everyone safe with this watch your step sign that measures 12" x 12". If you have uneven walkways, stairs or other areas where one is prone to trip and fall, make sure you post notice with this sign. This notice sign is made from heavy-grade aluminum and comes with pre-drilled holes, a weather-resistant full-color design, and rounded corners.